QUALIFICATIONS: Licenciatura (BA Hons equivalent) in English and German Philology (Premio Extraordinario), PGCE in English & Spanish (equivalent) from the University of Valencia (Spain); MA in Modern & Contemporary Writing, PhD in English Literature from the University of Sheffield. Dr Noriega-Sánchez joined the University of Cambridge Modern & Medieval Languages (MML) Faculty in 2008, where she holds the position of Senior Language Teaching Officer in Spanish. Since September 2009 she has also been a Director of Studies in MML for undergraduate students in Sidney Sussex College, and an UG Tutor since 2015. Previously, she taught Spanish language and culture studies, Translation, EFL, and English Literature at several HE institutions in the UK, namely, the University of Sheffield, Royal Holloway University of London, Anglia Ruskin University, and the Open University. Her research interests lie in the fields of language learning and teaching, translation studies, and comparative literature. Her publications include articles and books on language pedagogy, and Latin American and US studies, as well as a number of Spanish language course books and interactive DVD-ROMs for the Open University. She also worked as a consultant author for the 'Spanish at Your Fingertips' project, an online language programme developed by the University of Cambridge Language Centre in partnership with BBC Worldwide. Current research interests focus on translation pedagogy, curriculum design and use of new technologies in the development of language learning material. · Carreres, Á. 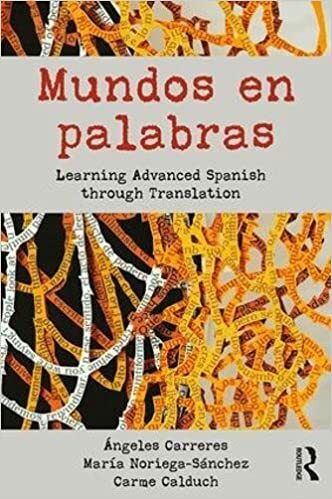 & M. Noriega-Sánchez, 'Traducción pedagógica (Pedagogical Translation)', The Routledge Handbook of Spanish Language Teaching: metodologías, contextos y recursos para la enseñanza del español L2, eds. J. Muñoz- Basols, E. Gironzetti & M. Lacorte (London & New York: Routledge, 2019). · Carreres, A. & M. Noriega-Sánchez, 'Traducción pedagógica y pedagogía de la traducción: un diálogo necesario', Actas XXIII Congreso Internacional de la ASELE (2013), 253-261. · Carreres, Á & M. Noriega-Sánchez, 'Translation in Language Teaching: Insights from Professional Translator Training, Language Learning Journal, Vol. 39, Issue 3 (2011), 281-297. · Noriega-Sánchez, M. & A. Peña-Calvo, 'Mortadelo de la Mancha: el cómic como parodia y su aplicación pedagógica', in Bilderwelten, Textwelten, Comicwelten. Romanistische Begegnungen mit der Neunten Kunst, ed. by F. Leinen & G. Rings (München: Meidenbauer, 2007), pp. 333-349. · Noriega-Sánchez, M., '"The New Buffalo": Reservation Gambling in Louise Erdrich's The Bingo Palace', in Nor Shall Diamond Die: American Studies in Honour of Javier Coy, ed. by Carme Manuel and Paul Scott Derrick (València: Universitat de València, 2003), pp. 365-373. · Noriega-Sánchez, M., 'New York vs. Willow Springs: Remapping America in Gloria Naylor's Mama Day', in Proceedings of the 25th International Conference of AEDEAN, ed. by M. Falces et al (Granada: Universidad de Granada, 2003), CD-ROM. · Noriega-Sánchez, M., Challenging Realities: Magic Realism in Contemporary American Women's Fiction (València: Universitat de València, 2002). ISBN: 84-370-5422-2. · Noriega-Sánchez, M., 'Louise Erdrich's Tracks as a Magic Realist Narrative', in First International Conference on English Studies: Past, Present and Future, ed. by Annette Gomis van Heteren et al (Almería: Universidad de Almería, 2001), pp. 679-684. · Noriega-Sánchez, M., '"Ain’t Nobody Really Talking to You": The Reader in Gloria Naylor's Mama Day', in Los estudios ingleses: el reto del tercer milenio, ed. by Francisco Fernández (València: Universitat de València, 2000), pp. 269-75. · Noriega-Sánchez, M., 'A Male or a Female Quest? : Morrison's Song of Solomon and Silko's Ceremony', in Proceedings of the 22nd International Conference of AEDEAN, ed. by Pere Gallardo and Enric Llurda (Lleida: Edicions de la Universitat de Lleida, 2000), pp. 545-549. · Noriega-Sánchez, M., '"Where Ghosts Might Enter Without Affrighting Us": Magic Realism in Contemporary American Fiction', in Los estudios ingleses. Situación actual y perspectivas de futuro, ed. by Francisco Fernández (València: Universitat de València, 1999), pp. 311-318. · Noriega-Sánchez, M., 'A Bakhtinian Reading of William Faulkner's As I Lay Dying', Revista de Estudios Norteamericanos, 6 (1998), 51-67. · Carreres, Á. & M. Noriega-Sánchez, review of Spanish Idioms in Practice by Javier Muñoz-Basols, Yolanda Pérez Sinusía & Marianne David, Bulletin of Spanish Studies, Vol. 92, Issue 6 (June 2015), 1013-1014. · Carreres, Á. & M. Noriega-Sánchez, review of Developing Writing Skills in Spanish by Javier Muñoz-Basols, Yolanda Pérez Sinusía & Marianne David, Bulletin of Spanish Studies, Vol. 90, Issue 7 (November 2013), 1188-1189. · Noriega-Sánchez, M., review of 3000 locuciones verbales y combinaciones frecuentes by Adela Robles-Sáez, Bulletin of Spanish Studies, Vol. 90, Issue 2 (March 2013), 263-264.